The phenomenon of the Coney Island is one of the greatest aspects of eating out in the Detroit area in Michigan. Completely unrelated to the actual Coney Island in New York, these restaurants are a result of the mixing of Greek and American foods, with the addition of the famous Coney Dog. Everyone has their favorite Coney Island, and sometimes the favorite one is just around the corner. I grew up with Farmington Coney Island half a mile away and would go at least once a week. Over time, the place underwent a few name changes, such as Farmington Souvlaki (alluding the Greek heritage of the place), but eventually it came to be known as Leo’s Coney Island, named for the owner, Leo Stassinopoulos. Leo was as much a part of the community as any of the customers and I went to high school with his son, also Leo. The Coney in Farmington Hills is the flagship (in my mind) of an ever-growing Empire of Leo’s Coneys, supposedly even reaching Chicago in the future. Despite name changes and growth, Leo’s remains one of the best places to get good quality, fast and cheap food. There have been days I’ve waited in line at Taco Bell longer than it has taken me to get seated at Leo’s, eat and pay. At one time, I was able to just go in and order my usual (two grilled cheese pitas without pickles and a side of well-done cheese fries with the cheese on the side). Times and the waitstaff has changed, and since I rarely make my way back to Coney, on my most recent visit I decided to change my order. Instead of my usual, I ordered a Coney Dog and a Loose Burger with a side of well-done cheese fries with cheese on the side. The dog and burger both come with mustard, onions and Coney-style chili. I ordered mine without the mustard or onions, since I’m not a big fan of mustard and onions are one of my unvegan enemies. Just look inside that beautiful Loose Burger. 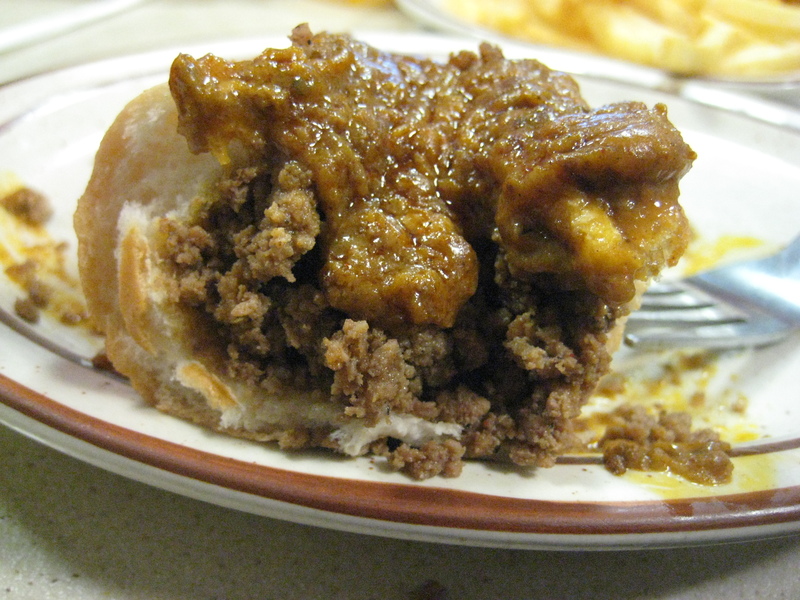 Now, you may be wondering what makes Coney-style chili different from other chili and honestly I’m not totally sure. It looks pretty terrible, but tastes amazing. It is the perfect topping for the Coney Dog and the Loose Burger. The Loose Burger is pretty much exactly what it sounds like. Rather than cooking ground beef into a patty, the loose burger is made by cooking the beef while it is still ground and separated, kind of like taco beef. 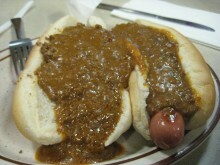 Then, to keep it from falling apart, it is dropped in a hot dog bun and topped with the chili. 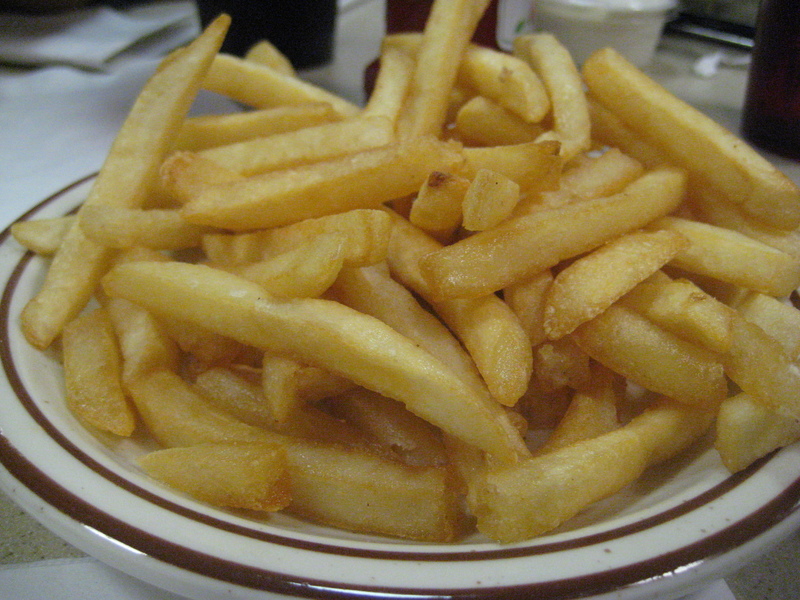 Crispy and perfect in a dip of cheese. As usual, my food arrived quickly and was just as I remembered it. The dog had a little snap to it, but wasn’t too fancy. I did my best to keep the chili on it while eating, but there is only so much one can do. The loose burger was great as well, and since it is already loose, it saves me that unnecessary step of chewing before swallowing. Grabbing a meal at Coney is a must in this area, so much so that my step-brother-in-law, who has never lived in Michigan, makes sure to stop at a Coney every time he visits and orders at least three Coney Dogs. This food isn’t pretty, but it is damn good and damn cheap. I’m not even sure it’s possible to find a meal there for more than 10 bucks a person. It won’t win any culinary awards for groundbreaking food, but Leo’s Coney Island is the kind of restaurant the world just doesn’t seem to have enough of. bravo – clap clap clap. World peace, naaaahh who needs it when you have Leos. If I had a choice, I would pick Leos every single time. With war, that’s less pepole to be in line ahead of me at Leos. Just last week i had 2(x) the Leo’s experience. 6 coneys in 2 days and it was not enough. Detroit gets mad points over Chitown for this establishment – no doubt.